Washington-DC: The Creating Change Conference is being placed in the experienced hands of Andy Garcia, ensuring it is on track for a powerful 31st convening in Detroit, 2019. On April 10, the National LGBTQ Task Force announced Andy Garcia as the next director of Creating Change. Garcia succeeds Sue Hyde, the conference’s founder. The search for a new director was initiated when Hyde announced in November that she had accepted the position of executive director of the Wild Geese Foundation. The primary goal of the Creating Change Conference is to build the LGBTQ movement’s political power from the ground up to secure the full freedom, justice, and equality for lesbian, gay, bisexual, transgender, and queer people in the United States. In addition to running the annual Creating Change Conference, the director oversees the Creating Change Department, including its leadership development programming. Garcia comes to the Task Force from the Equality Federation, where he has served as the Senior Manager of Leadership Programs. In that role, he coordinated the Equality Federation Leadership Conference, an annual training and organizing event for leaders and activists from statewide LGBTQ political organizations from around the United States. Prior to the Equality Federation, Garcia worked for the Planned Parenthood Federation of America. Garcia has also served in many roles within the LGBTQ movement. 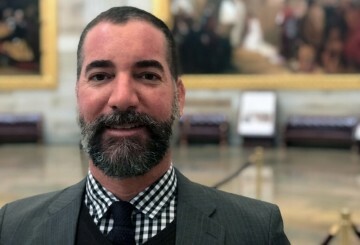 Garcia served on the staff of The Pipeline Project, working to increase the number of people of color in leadership positions within the LGBTQ movement. He served as program director at the Boston Alliance of GLBT Youth (BAGLY), which included organizing the annual BAGLY Youth Prom, an event that annually draws over 2,000 youth from throughout New England. Garcia also served on the staff of the National Youth Advocacy Coalition (NYAC).